This powerful workshop is designed for leaders who want to reach new levels of personal and professional success. It is offered in a one-day or two-day format, and can be delivered onsite at your organization. We also offer open enrollment programs twice a year. This interactive workshop is based on Jack Canfield’s book The Success Principles: How to Get from Where You Are to Where You Want to Be, will be highly engaging and promote teamwork and connections on the team. At the same time, leaders will be empowered with strategies to take more personal responsibility, develop stronger relationships, and increase action and results. 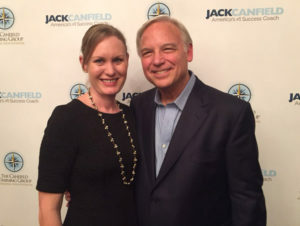 In his book, Jack Canfield shares 67 principles highly successful people use to achieve extraordinary results. Laurie will share eight of these principles that will strengthen individual and team performance. This workshop is very fun and engaging, while also hitting on some very important elements of team success: trust, accountability and ownership, clarity and vulnerability. This workshop is a fun way for team members to deepen relationships so you can quickly build trust and cohesion. Even teams that have been working together for a long time report significant improvements in trust and working relationships. Laurie Maddalena is a certified Success Principles trainer, and has mentored directly with Jack Canfield, author of the Chicken Soup for the Soul series. Your team members will leave this workshop feeling energized and inspired to elevate their success! This program is available onsite at your organization. We also offer an open enrollment session twice a year.